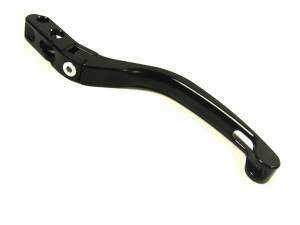 A multi-adjustable lever with a unique aerodynamic shape, and the folding lever gives extra function to the brake and clutch lever. Aesthetics and practicality are naturally of the highest order the lever is shaped from the solid and anodized in black. An articulated joint is added to avoid breakage in the event of a slide. Only fits aftermarket Brembo GP radial master cylinders in 18mm.